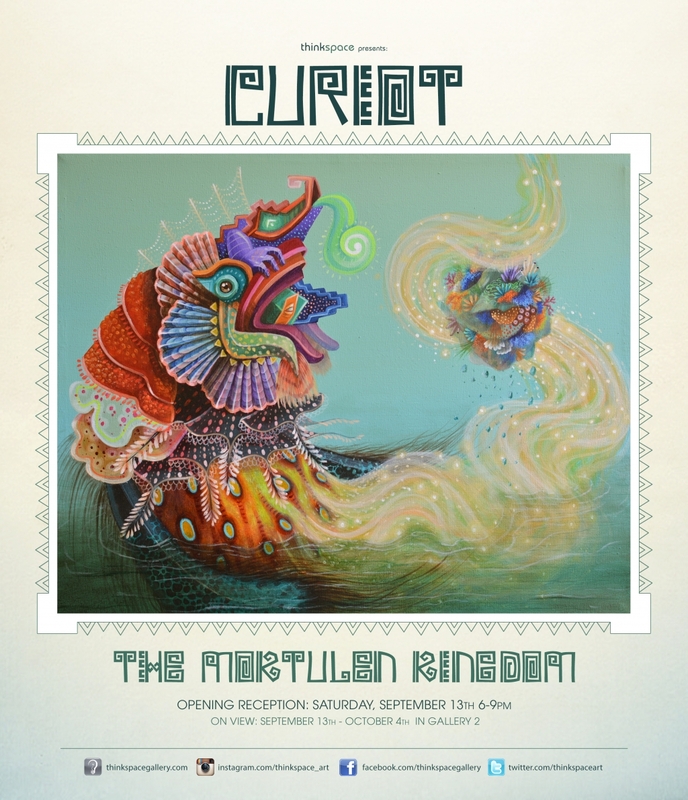 Concurrently on view in the Thinkspace Project room are new works by Curiot in Moktulen Kingdom. Working out of Mexico City, Curiot’s approach to imagery is energetic and monumental. 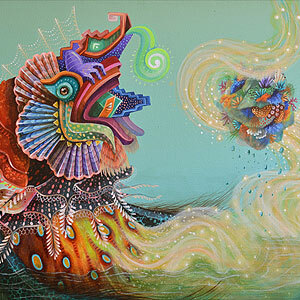 An accomplished painter and street artist, his mythical murals are internationally renowned for their vibrant palettes and host of surreal creatures. Influenced by his Mexican heritage, and an appreciation for its cultural legacies, Curiot incorporates aesthetic elements to invoke its crafts, design and legends. Drawing from visual patterns, geometries, Day of the Dead styles and mythology, Curiot creates powerful visual hybrids from a combination of contemporary imagery and ancient culture. Curiot often pits man against nature in epic, quasi-mythical, encounters, creating works that convey an undeniable feeling of tradition and legend. Symbolically immense and populated by beautifully strange composite creatures, his works thrive as larger than life metaphors for the oldest of human conflicts: the struggled reconciliation of the natural and human worlds. The artist’s attention to detail is staggering. Working on massive public scales at times, and on huge architectural surfaces, his command of large-format minutiae is humbling. Curiot’s vibrant and saturated pieces command an incontestable presence in the gallery and on the streets, and remind us of the power of the visual to sustain both the present and the past.